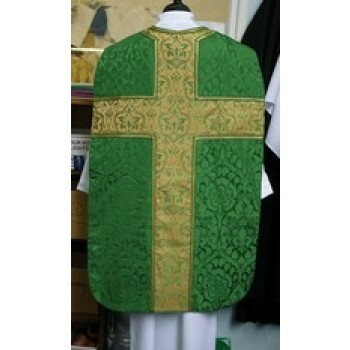 The fiddleback chasuble is similar to a traditional chasuble, but with a reduced front panel. This slight alteration allows the wearer greater mobility and comfort, enabling them to move their arms enough to cross them in the front. Fiddleback chasubles are also known for being stiffer than traditional chasubles and for having heavy embroidered designs on the front. The heavy embroidery and thick, lined materials that the chasubles are made of help them maintain their trademark shape, even while being worn. 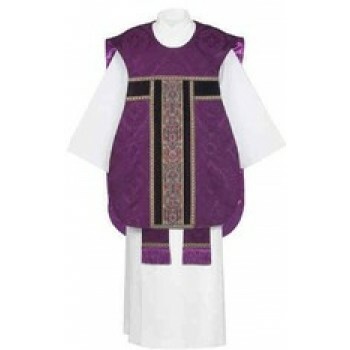 Matthew F. Sheehan carries a large selection of fiddleback chasubles to choose from in a variety of liturgical colors and designs. 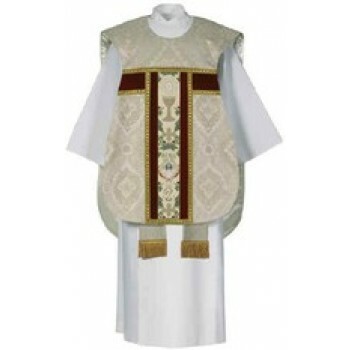 Our fiddleback chasubles have a traditional shape with a rounded neckline. The body of the vestment is cut inward at the arms to allow for greater freedom of movement during services. Fiddleback chasubles also have founded corners and a front that is slightly higher than the back. Most styles are heavily embroidered with tapestries, contrasting bands and other similar details. 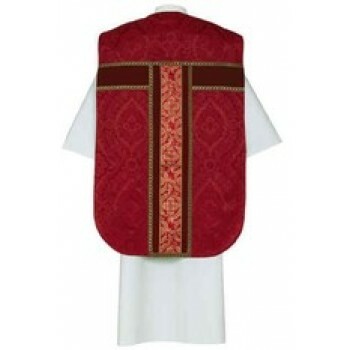 Our fiddleback chasubles are decorated on the front and the back with heavy embroidery. Select styles may also be customized by adding a memorial label to the inside, printed with up to 2 lines of your own text. Memorial labels will incur an additional fee. Matthew F. Sheehan carries only the finest liturgical vestments on the market. 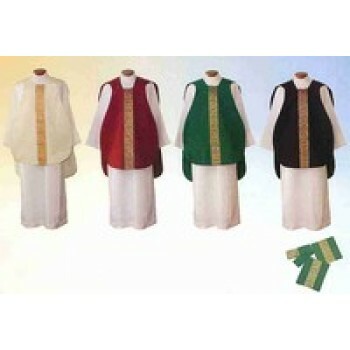 Our fiddleback chasubles are made by well-known brands including Hayes and Finch and Trenton. These brands have a reputation for quality and are loved for their attractive, innovative styles. 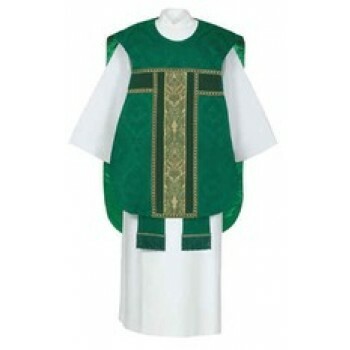 Our selection of fiddleback chasubles have been chosen for their quality, style and traditional appearance. Matthew F. Sheehan has been in business since 1907 and strives to offer the finest selection of quality religious goods on the internet. For more information about one of our fiddleback vestments shown here, or for help ordering, please give us a call at 1-617-971-9800. When you call, you'll be connected with one of our friendly and knowledgeable associates that will be happy to assist you.